When you´ve been planning for some time, you´ve had the opportunity to try out different planning methods, probably more than one planner, and definitely more than one pen. This year I´m very surprised at how easy it´s been to find a system that works for me and sticking to it. It definitely has to do with all my trial and errors in the last years, but I think my bullet journal in 2016 played a really big role in helping me decipher what my planning needs were. Of course there are always some alterations and changes that happen during the year, but all in all I think I´ve got my system down and within that system my *must have* planning essentials in order for me to keep an organized life. So here they are. Of course my number one essential in keeping an organized life is my planner. I´ve been using the Hobonichi Cousin for all of 2017 and it´s by far been my favorite planner that I´ve tried. This book is my main planner, where I keep track of everything about my personal life and daily doings. It has multiple layouts to organize different areas of my life and plenty of room for extra information I might need to add. Everything about my day goes in here and without it I would definitely be lost. I have a setup and flip through video on my channel from the first 4 months of the year if you´re curious to see how I plan inside it. This notebook is complementary to my Hobonichi Planner. I use a beautiful A5 black polka dotted gold foiled notebook (try saying that 5 times! ), and even though its exterior is pretty and elegant the interior is not. I use this notebook as a braindump list, so whenever I have an important idea or thought it goes straight into the list. The pages are full of chicken scratch writing, cross-outs and post-its. It really is a mess, but a mess that helps me check all of my to-do´s and projects. This is the notebook I pull out at the beginning of each month to pre-plan my days. There´s a quick and sweet blog post all about my pre-planning process so you are welcome to check it out for more information. Having a trigger list is essential for creating braindumps, so of course I had to include it into my *must haves*. The trigger list gives you a set of “prompts” with all the different areas of your life in which you might possibly have something to do. This way no task is left without being thought of and written down. The one I use is from David Allen, you can simply print it out and attach it to your planner or braindump book, however I like having notebooks for everything so I decided to transfer the list into another one of my beautiful gold-foiled notebooks, in a pocket size. It´s separated into personal tasks and work tasks, this way its much more comfortable for me to group my to-dos and schedule them out. Because it´s so light and small I can easily slip it into my carry-all pouch and have it at hand when I need to go through my braindump process. I´m not one to have multiple planners, but I do own a Moleskine Monthly Planner. Its sole purpose is in keeping me aloop with my content scheduling, or in more common terms, it is my Editorial Calendar. So far I haven´t been very good in keeping up with what I have scheduled inside, but I still find it super useful in keeping track of when I´ve posted content on my blog, my youtube channel, or if I´ve done any special sales or giveaways in my stationery brand. This notebook also stores all of my content ideas and key information for my website (image sizes, links, passwords, etc.) so it is essential in my planning. 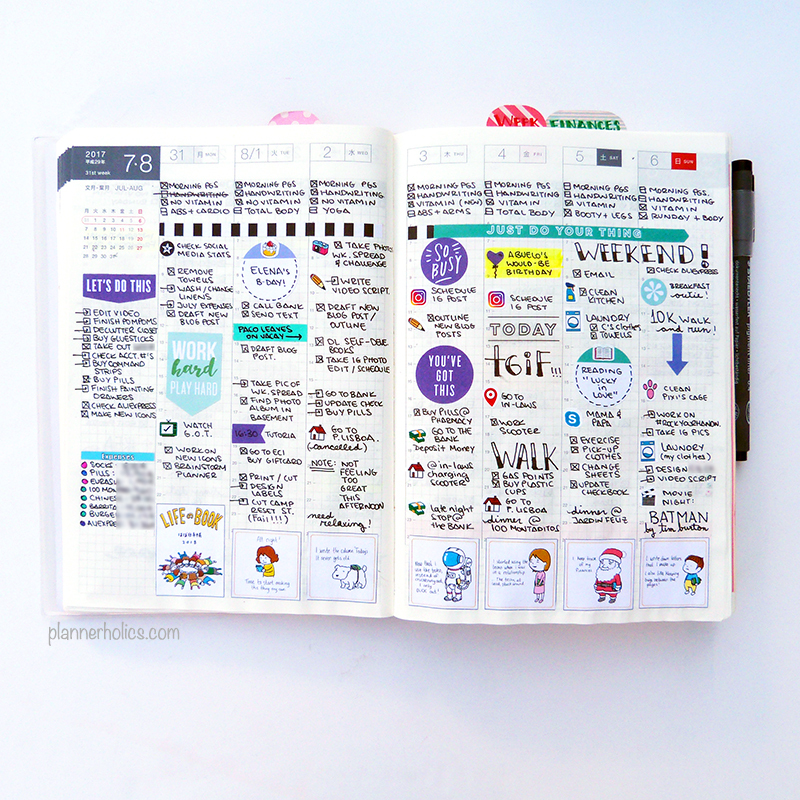 I like to have this planner separate from my main planner because it´s much easier for me to ONLY view my content ideas on the calendar and nothing else. This allows me to know when to schedule, what to post and in which platform. 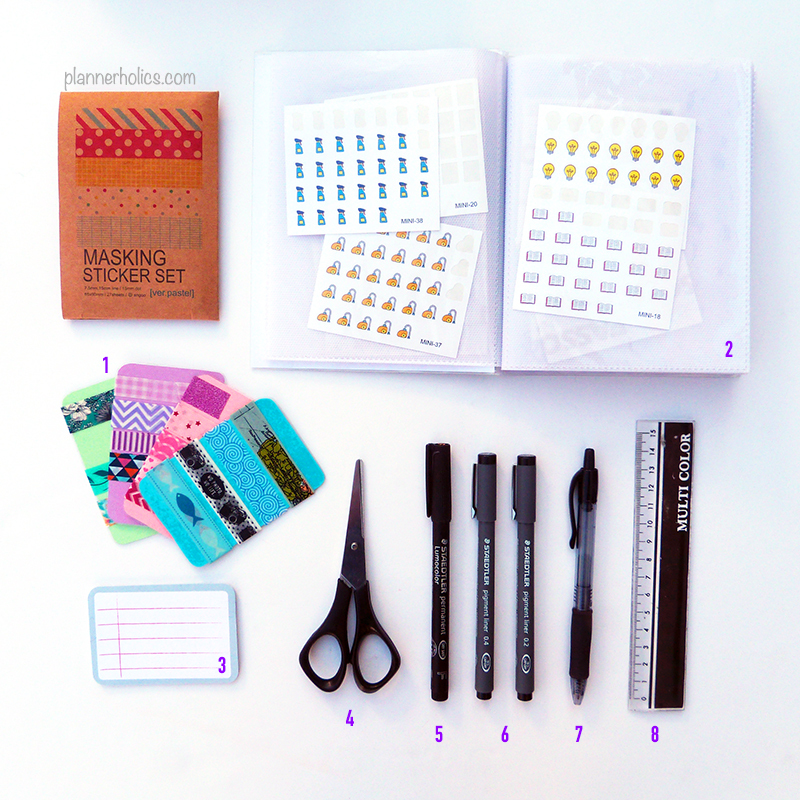 Washi tape samples: of course I have a ton of washi rolls and I can´t obviously pack them all in my purse, so instead, I like to wrap a few of my favorite ones onto small pieces of laminated cardstock, creating what they call “washi samples”. This way it doesn´t have to bulk up my pouch AND I can have different designs at hand to highlight events in my planners. 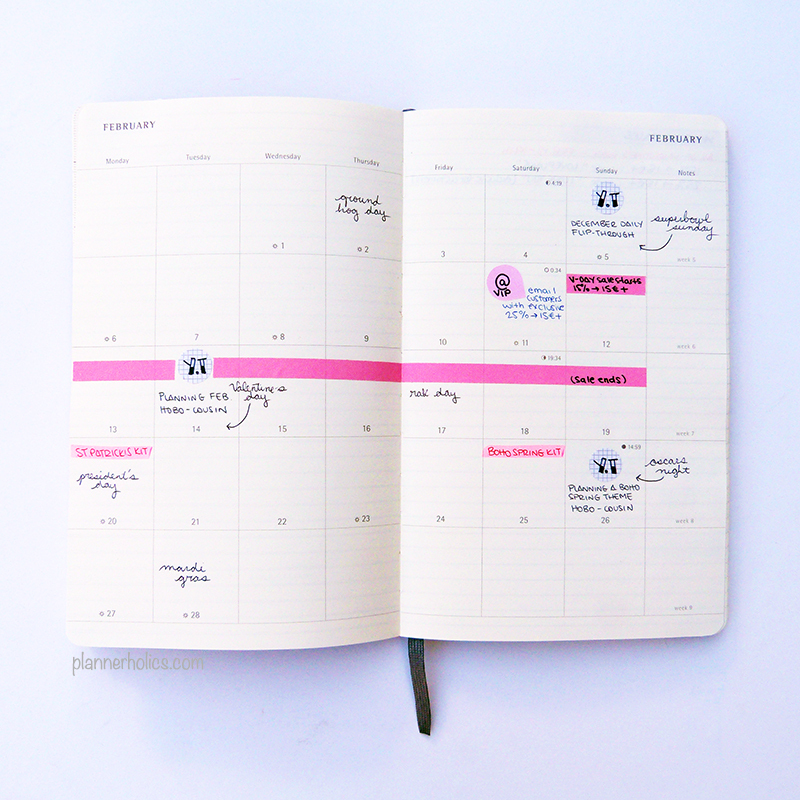 Mini-icons and label stickers: these stickers are the best thing that I ever decided to create, they are totally functional and small enough that you have plenty of room to write out events or tasks in the planner. I find them essential specially when I like to point out important to-do´s or occasions in my week, because they are quick to spot and give me an overview of my days. 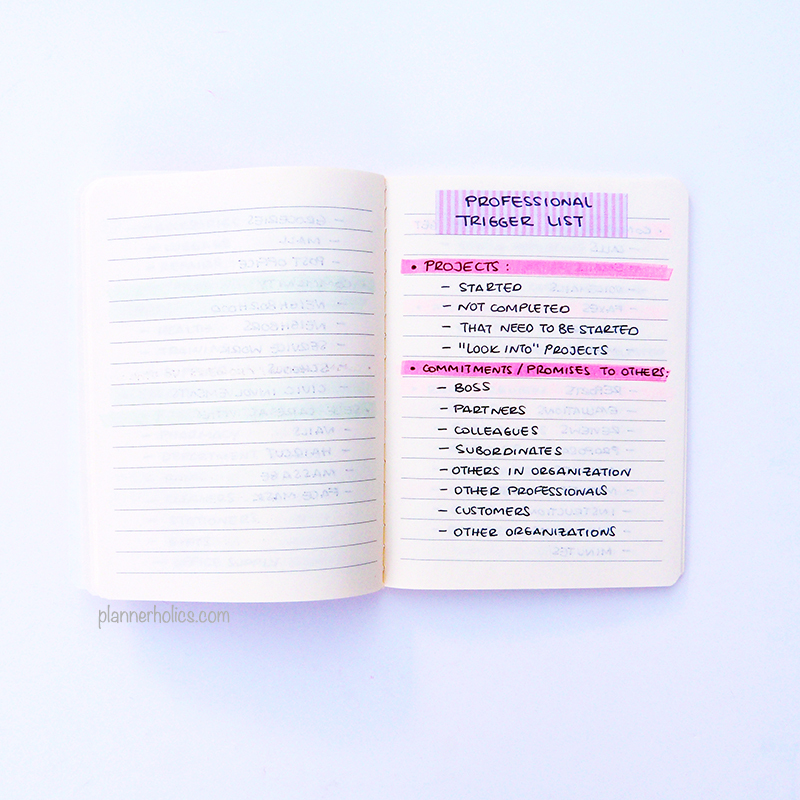 Sticky notes: these are extremely important in my pre-planning process, as I like writing out all of my appointments and tasks on them and then deciding where I´ll be scheduling them inside my planner. They are a really flexible tool because you can move them around anywhere you need. Scissors: just a small ordinary pair in case I need to trim or cut anything. Staedtler Lumocolor F black pen: This is an awesome pen for writing on top of washi tape, stickers or any type of waxy surface. Staedtler Pigment Liner black 0.2 - 0.4 tip: This is by far the best pen to use in my Hobonichi. It dries really fast and I specially enjoy the bold color it has while still maintaining a thin stroke, allowing me to write small in each section and maximizing the space in the page. Pilot G-2 07 black pen: I love the ink from this pen, it´s very sleek and smooth and writes wonderfully in my braindump notebook. 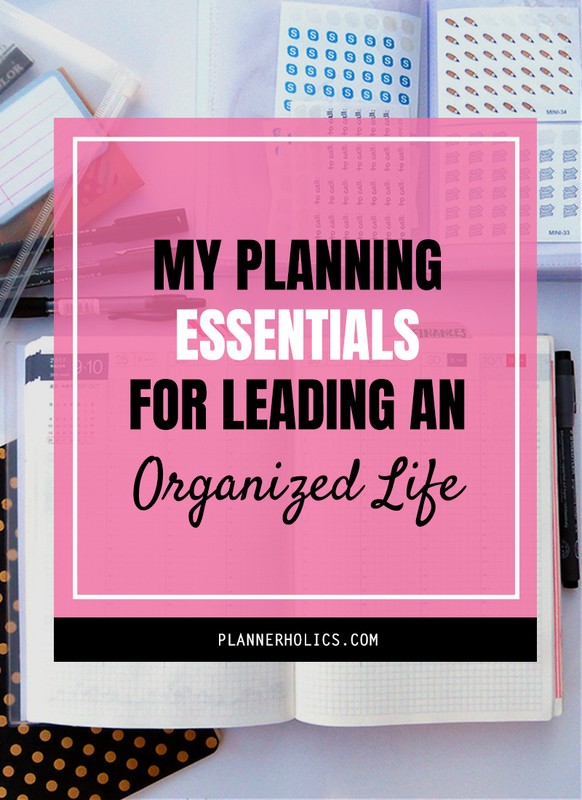 Like I mentioned, these essentials play an important part in my planning routine and help me keep things organized. My tip for you? Try, try, try. It´s taken me some time to find the right tools for my system to work, but in the end it´s about keeping things simple and minimizing it to what really matters. I would love to know what your essentials are. 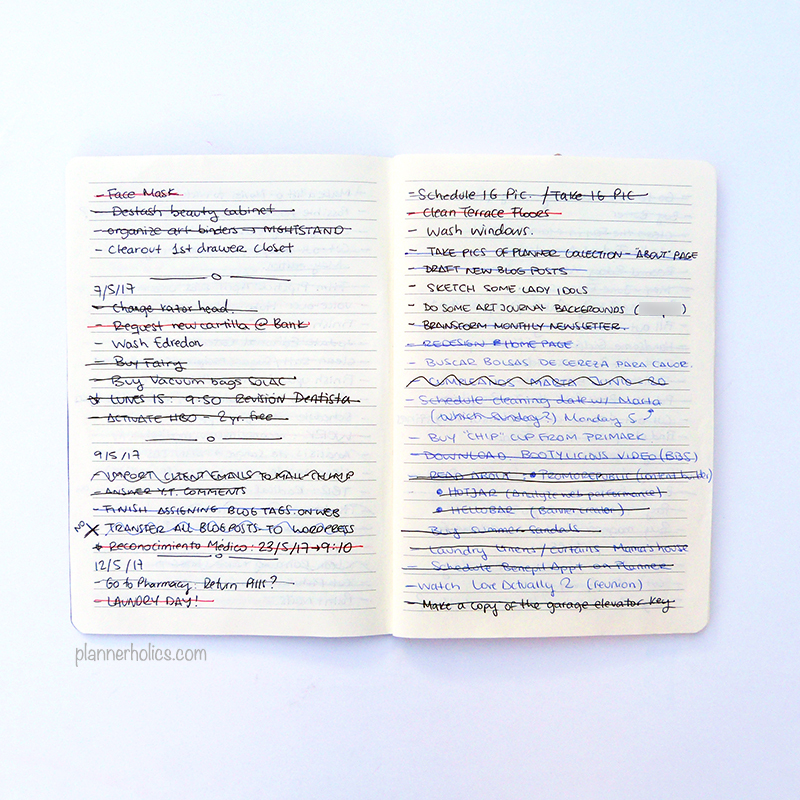 Hopefully this post gave you some ideas to incorporate into your planning method or perhaps it made you think about breaking down your system into something simpler. Either way I would love for you to share them with me; your troubles or successes. Knowledge is everything, so together we might be able to help somebody out. If you want an even further view into my setup, go ahead and click on my video below for some peeks inside my notebooks.